Many homes these days prefer to use modern or contemporary design. Not just because it looks great but it is also trendy and practical. But that does not mean that other design styles are no longer used. In fact, many homeowners still use traditional interiors while others opt for neat yet artistic Scandinavian spaces. Did you know that other homeowners actually want to mix two different styles? Yes, some homes actually put together modern design with other styles. It works really well! It results in a stunning space that is unique and practical for the users. 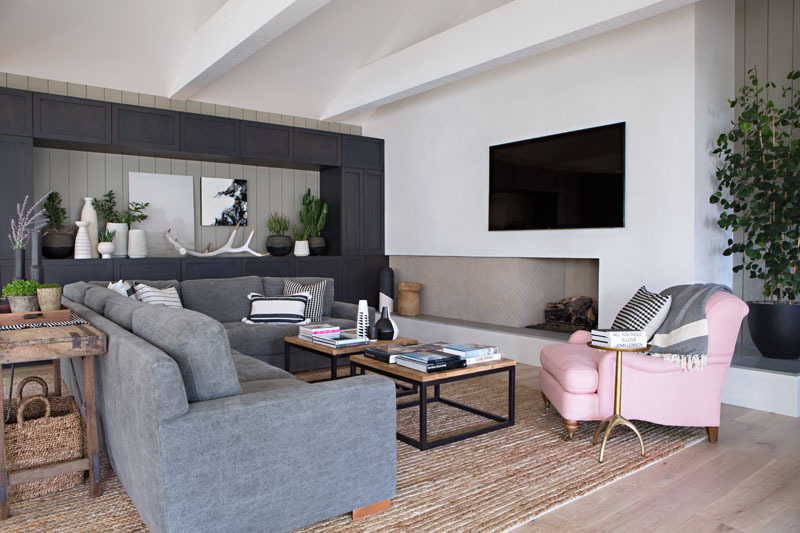 This is what the designers did to a home in Newport Beach, California. 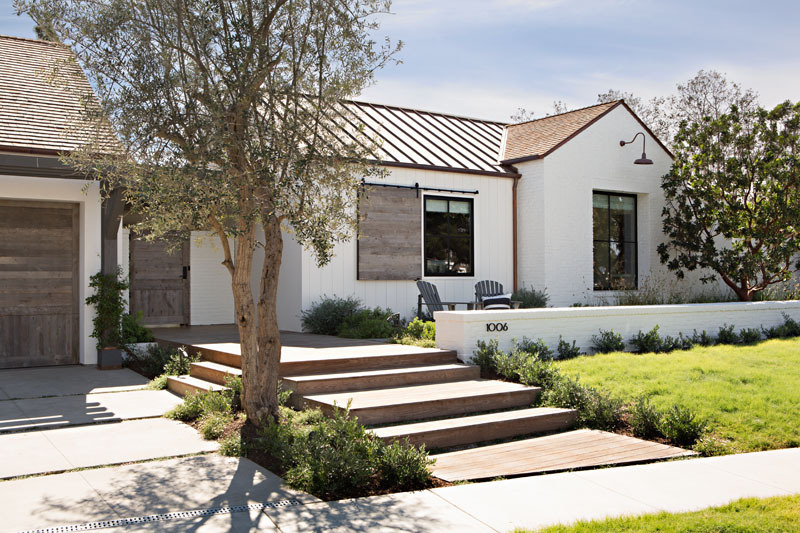 The project is called Somerset and its interior adopted farmhouse style. But it is beautifully combined with some contemporary features. Want to see how it looks like? Check out the images of the house below. Unique feature: This home has some farmhouse features that are seemingly combined with contemporary style. 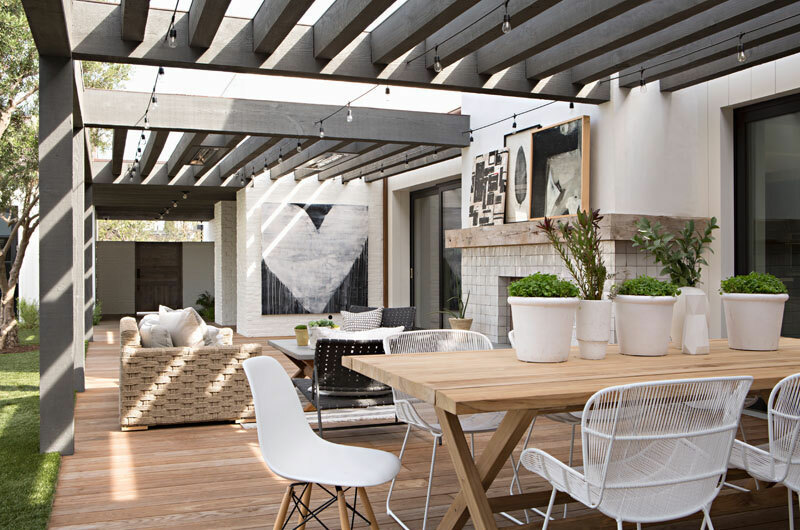 This gorgeous farmhouse-inspired, contemporary house is located in Newport Beach, California. You will like it even more once you see its interior. This is the living room of the house which features dark cabinetry along one wall. It creates plenty of storage as well as a place to display favorite items. It also has a fireplace and a comfortable couch and rug that all add a sense of warmth to the room. Upon entering the house, guests are greeted by an artistic bare-bulb light installation and a simple yet beautiful “hello” wall mural. Isn’t this a good way to welcome guests? 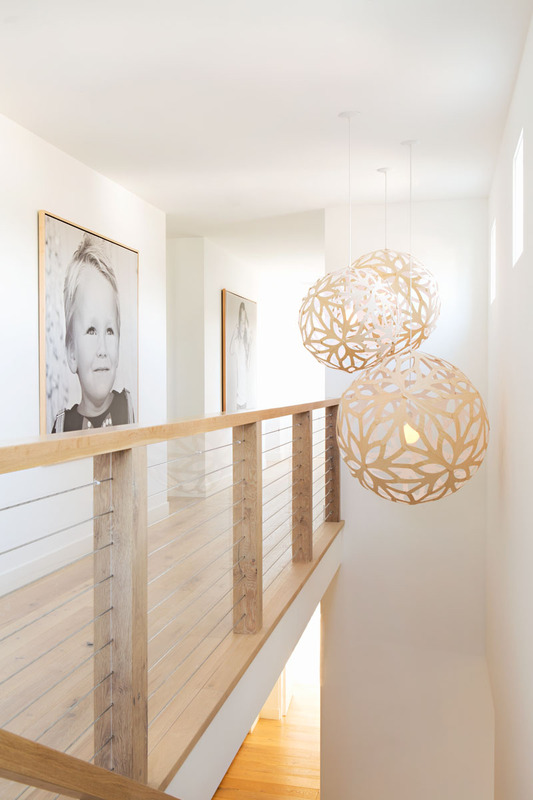 Heading upstairs, one can see simple decorative pendant lights that hang above the stairs. Although it is simply made from wood, it looks nice with the cable handrail that gives the home a farmhouse look. 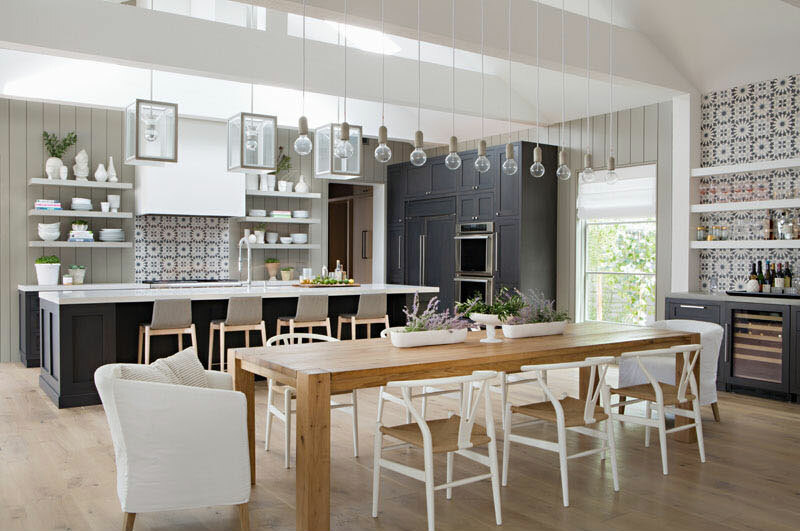 Simple light bulbs hang above the dining table which helps to anchor it in the open floor plan. Beside the dining table is a bar area with white floating shelves and decorative tiles. You can also get a glimpse of the home’s kitchen in this picture. The floating shelves and decorative tiles in the dining area creates a cohesive look with the kitchen. The wooden dining table with white chairs gives the space that farmhouse look! The dining table is large and could fit up to eight persons. 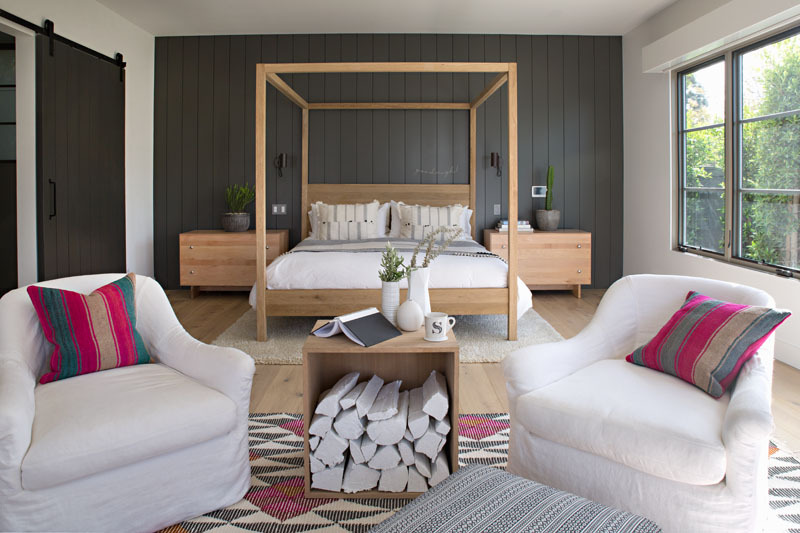 Seen here is the master bedroom with dark grey wood paneling as an accent wall. 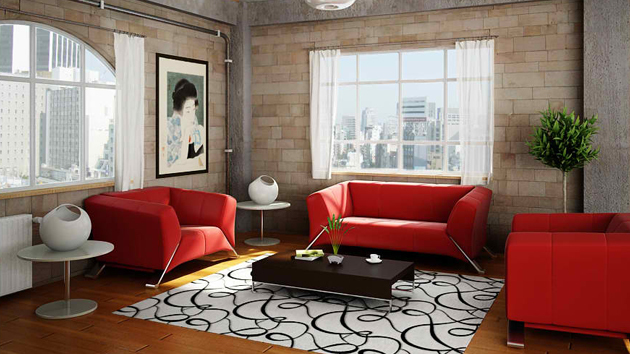 The light wood and white furniture is a good contrast that keeps the area bright and beautiful. In this bathroom, it features a custom white vanity with open storage and built-in drawers. It runs the length of the wall and it drops down to create a built-in bathtub. The grey floor tiles of the bathroom are in a herringbone pattern and there are multiple windows that break up the white room. Another bathroom in the house which has a wall above the bath that is covered with art. You can see that it used a ladder as a place to hang towels, which is very creative. This is the kids bathroom. It has fun tiles with a plus pattern which is also used in the shower. There is also a built-in shower shelf which is at the perfect height for little kids. 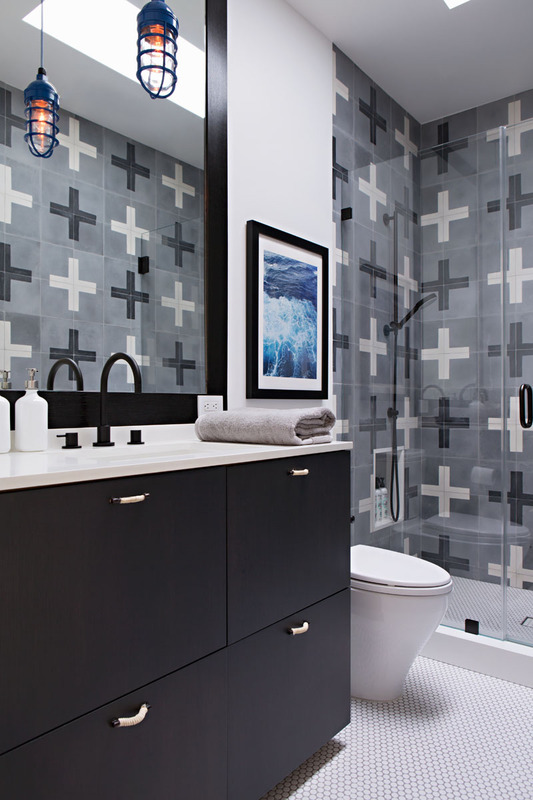 The black vanity, faucet and the mirror frame compliment the black color in the tiles. Off the interior social spaces is an outdoor entertaining area. It has a fireplace, lounge, and an outdoor dining area. Isn’t this very relaxing? Seen here is the swimming pool area which is located beside the outdoor entertaining space. The pool house has large sliding wood barn doors that open to reveal another lounge area. One side of the house which faces the pool has glass doors and windows that seamlessly connect it to the outdoor space. Notice also that the pool landscape is beautiful and adds to the relaxing aura of the area. This project is a result of the collaboration between RailiCA design and Eric Olsen. Well, as we can see it, it turned out really nice! Others would think that a farmhouse home looks plain and old. But after you saw the interior of the Somerset house, you will surely change your mind. Instead of looking old, it actually looks really beautiful and unique. It just depends on how the interior is being designed. Once it is done well, it will turn out beautiful. Would you like to have a farmhouse interior like this one?